I had the pleasure of traveling to Bloomington, IN to cover Tim Hiller and the Western Michigan University football team as they took on the Indiana Hoosiers. The article on the game and Tim's performance ran in Orrviews last month, but there was plenty of minutiae that I had the pleasure to document....some cool, some funny...but all of it was interesting. I hope you find it interesting too. I'll break it into 2 parts...first part will focus on the pregame, and part 2 will be the game experience. I loaded up the family, fueled up with a steakburger at Steak & Shake in Columbus and made the trip. Local photog and friend Scott Ferrell was making the drive separately and we'd meet up the next morning. The drive was 5 hours to Franklin, IN. We stayed at a hotel near where friends of ours stayed with family. One thing was abundantly clear...Indiana seems to be known for 2 things (besides basketball)....RV dealerships and candle outlet stores...or that's the impression I got from reading dozens of billboards along I-70. I stayed up to date on my beloved Red Riders as they took on Copley, the beep of my cellphone indicating a received text message was music to my ears as the home team put it on the Copley Indians early and often. The idea was to get down to the stadium early. I wanted to see the surrounding area, especially Assembly Hall, but we also knew that, although we had press passes (sideline and press box!! ), we knew there was the potential for snags. We were there around 9:30am for a noon kickoff. It just felt like it was going to be a good day...and I was ready with camera in hand. Didn't take long to find something picture worthy. This was apparently something called the "Ride to the Rock," and the pictures really don't do it justice. There were a lot of bikes in this procession, some even having custom made IU motorcycle/football helmets.......and then there was this guy. The announced attendance was just over 30,000...in a stadium that seats 52,000. The running joke was that someone should have pointed this guy to the BOX OFFICE (!) for his ticket. But I'm guessing that watching the game was not on his agenda. We followed the crowd over to the top of the steps just outside of Assembly Hall...there was some sort of hopeful tradition where the team and their families would walk from Assembly Hall over to Memorial Stadium. It was called, amazingly enough..."The Walk." Really. A face in the crowd caught my eye during the procession.....I'll show you the pic and see if anyone looks familiar. There was some debate on this, but I will swear it was this guy. That's right, my first celebrity sighting....IU basketball coach Tom Crean. He was there by himself, among the masses, supporting the football program. Kind of cool. This would not be our last run-in with Coach Crean. Ok...enough distraction...let's get to Assembly Hall. Luckily, Scott's nephew Tyler is an IU student and he proved to be invaluable, especially at Assembly Hall. 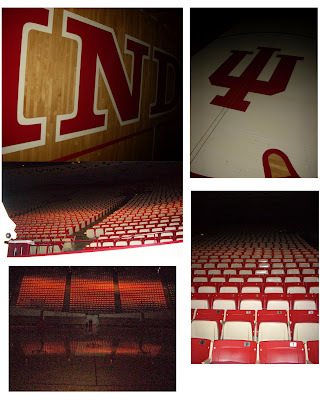 We made our way down a few flights of stairs, down to the IU gift shop in the bowels of the arena. I knew we were probably on the floor level, and then we came upon this..
"PRACTICE CLOSED - NO ADMITTANCE" Dang. Practice on football game day? Not hard to tell what sport rules at IU is it? Ok...hopes dashed, we poke around at the gift shop and find nothing. We walk past that same door and I peek through the crack in the middle of the door. I see no sort of practice taking place, and in fact, I see a couple of gawkers (like I wanted to be) on the other side of the door. I'm re-invigorated. Maybe all hope is not lost. The place was very dimly lit, but you knew what you were looking at. The folks in that picture left, and it was just the 3 of us and 2 cops. Nobody minded me snapping a few pictures, so off I went. I must say how stunningly beautiful that floor was. You could polish your wood floor once a day for the rest of your life and it would not be as shiny as this floor was. Then something interesting happened, the cops left. Just walked out. We were by ourselves in one of the meccas of college basketball. All I needed was a cart of basketballs and I'd have done my best Tom Coverdale impression.....but I settled on taking a run at the hoop (got the net!! ).